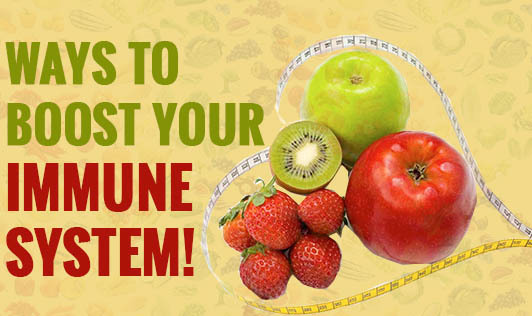 Ways to boost your immune system! One's lifestyle can affect how well his immune system can protect him from germs, viruses and chronic illnesses. In order to keep your immune system healthy, you have to replace your bad habits with healthy ones. • Eat healthy: Most people think about their health only when they fall sick. Don't wait until you are sick to care for your body. Making healthy food choices daily is one of the best ways to maintain cardiovascular health, improve energy levels and keep your muscles and bones strong. • Exercise regularly: Getting enough exercise daily improves cardiovascular health and reduces the likelihood of certain chronic diseases. • Get good sleep: Getting inadequate sleep can lead to higher levels of stress hormone which may lead to more inflammation in your body. Hence, it's important to get enough sleep as it improves your mood, energy levels, prevents stroke and helps you manage your weight. • Don't stress: Everyone has some stress in their lives, but if it continues for a long period of time, it can make you vulnerable to illness, colds and serious diseases. Learn to manage stress by meditating, connecting with other people and even counselling will help. • Be hygienic: Take good care of yourself to help prevent the onset and spread of infections or other illnesses. • Develop a sense of humor: Laughing is good for you as it curbs the levels of stress hormones in the body and boosts white blood cells that fight infection. • Quit smoking and if you drink alcohol, drink only in moderation. • Socialise more: People with strong relationships enjoy better health and longevity than others do.